Beer doesn’t hold quite the hallowed place that wine does in the hearts of the people of Niagara, but it’s certainly climbing the ranks on lists about why people love visiting the area. From light crisp ales to sweet and earthy stouts, a handful of breweries have popped up in the region in recent years, and the beers they brew are starting to garner some much-deserved attention. 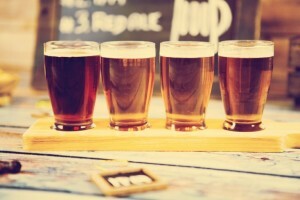 Whether you’re a beer lover on a perpetual tour of the earth’s finest brews or you’re just a guy who likes to drink good beer when you’re away from home, here are some of the best places to grab a pint of beer the next time you visit Niagara Falls. Syndicate Restaurant and Brewery blends the best of the farm with excellent food and beverages — just one of the many time-honored traditions visitors to the Niagara Peninsula have enjoyed for decades. 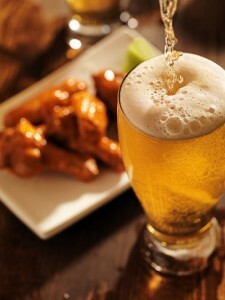 Fresh, local, gourmet food is served with elegant simplicity, and it’s accompanied by excellent beer made on-site. Order the Niagara’s Best Brown Ale, the Taps Rye Knot, or the Niagara’s Best Blonde Premium Ale, and pair any one of them with the duck poutine or a local, dry aged steak. Syndicate boasts three locations: Niagara Falls, St. Catherines, and Grimsby, but the Niagara Falls location is where the beer is made if you want to take a gander at their operation. Now in its 11th year, Taps Brewing Company — who also makes the beer served and enjoyed in Syndicate — features and perfects small batch craft beer using only the most basic of beer ingredients: pure filtered water, malted barley, yeast, and select hops. As with almost every libation in Niagara, the beer is made alongside an excellent restaurant whose award-winning chef’s menu includes better-than-basic pub fare. They boast six different types of poutine, including vegetable curry and Philly steak, and a handful of hamburgers worth writing home about. The beer taps change regularly, but if you’re able, knock back the Taps Charleston Lager and the Taps Red Cream Ale. Besides being a great pub with good food and beer, they also have live music and other entertainment throughout the week. Opening up in May 2015, Niagara Brewing Company is the area’s newest beer maker. Firmly planted in the tradition of Canada’s burgeoning craft brew scene, Niagara Brewing Company promises to make and serve one-of-a-kind beers using the best in locally sourced ingredients. At the helm of this new enterprise is Gord Slater, a brewery and brewpub developer whose roots in the business go down and back 30 years. With more than 60 breweries and pubs under his belt and plenty of awards for the beers he’s made, it’s likely his newest endeavor also pass muster. The Niagara Brewing Company is located in the center of the Falls View Resort. Whether you love beer as a companion to food or you love it in its own right, accompanied by good friends or a ball game, the beer in Niagara’s breweries continue to get better and more local with each passing year.